Ironman training plan for the busy triathlete. The employed/parents/coaches/fathers/mothers/commuters guide to an Ironman training plan. Have you ever watched those Ironman events on TV and said how the hell can they train for that? That was me at 18, watching those nuts and saying they must be mentally ill. Well now I'm 43 and with three 140.6 races under my belt, its official. I know the feeling "wow I got into the Ironman", which is quickly followed by "holy cr**, what was I thinking". First things first, remove all negative thoughts about finishing, it can be done and you will do it, with a proper plan. Ones life cannot be much busier than mine. Between a total 3 hour commute, full work day, 3 kids in multiple sports, coaching and training a variety of athletes, there is not much time left . Sound familiar? So if I can pull off an Ironman event so can YOU!. This is a light Ironman training plan that can get you to the finish line safely with a smile on your face. Any questions do not hesitate to contact me. It is good practice to consult with your physician before attempting this kind of training or endurance event. First let me start by saying I am not trying to win this thing. my goal is a sub 12:30 Ironman. The Ironman training plan below has successfully worked for me. This plan also assumes that you are an experienced triathlete, can maintain a run pace of 10 min miles for at least 1.5 hours, can swim 45min to an hour 3 days a week and you think you can maintain a 14-17 mile pace on the bike for 100 miles. Week 1 This is the week to get focused, plan on where you will swim, run and bike. Figure out what time of the day is best for you training. And to get your family and friends "on board". having that support system in place now will be key in the weeks ahead. Tuesday: 30 minute run, 1hr swim: focus here is on form. Thursdays bike will include hill repeats. My weekend workouts will be about getting the quality time in with focus on proper eating and drinking on the bike..
Tuesday: 30 minute run T2, 1:00 swim: focus here is on form. I will start to focus on training zones this week. I use a heart rate monitor but you can use the RPE scale Rate of perceived Exertion. T1 T2 and T3 will be my training zones with T3 training toward the upper end. Using the RPE scale T1 Breathing slightly higher, T2 aware of breathing harder, T3 beginning to breath hard. On occasion I will enter maximal exertion for short periods during interval training. Tues swim will be a total of 2400 yards with mixed drills ended by straight 800 yards will a cool down. Wed bike will be interval training. Thurs swim will focus on proper form and relaxed swimming. Fridays bike will include no momentum hill climbs. Sundays run should include some intervals but I will focus on maintaining a steady comfortable pace for the allotted time. Notes: I know this LP course and hill work on the bike is essential. Also as the weather warms up I will be testing my sweat rate. Very simply weigh myself before and after long rides and run, to keep track of proper hydration. If there is a big difference in weight I will know if i am under or over hydrating. Tuesday: 30 minute run T2, 1:15 swim: focus here is on form. Tues swim total 3200 yards Thurs swim total 4100 yards. Tues swim will be mostly technique work and drilling, right arm (ra) and left arm (la) only laps, catch up drills, and fist stroke. 2/2x100 at mid T2 and 10x100 at high T2 with 60 second rest in between. Thurs and Saturday swim I will warm up and cool down with some drills and focus on form, but the majority of the time will be straight swimming. Weekday bike and runs will be interval training with hills in the red zone, while the weekend bike and run will be easy pace working on getting the full time in. I am trying to keep this Ironman training plan as simple as possible and the times allotted should be used to the fullest potential to get the most of your time. As the weather changes I will consider getting some offshore swimming in. I am still resistance training 2 to 3 times a week for 30 minutes working to Momentary Muscle Failure in an effort to keep my strength up. Tuesday: 30 minute run T3, 0:45 swim: focus here is on form. This is a light week as far as time goes but a few T3 sessions have been added and note that Saturdays bike and run is a brick workout, so the run will immediately follow the bike ride. Focus on nutrition on Saturday. As the weather warms (hopefully) continue to monitor your sweat rate so you are hydrating properly. Thursdays long swim should cover at least 3000 yards. Add such drills as "catch ups, right arm only. left arm only, fist strokes and board kicks. Notes Weights/resistance training 2 x 30 mins this week to maximize your strength potential. 0n swim days yardage should be between 3200 and 4000 with interval training in the red zone. The weekend workouts will start to get a bit longer, as this plan is meant for someone who is working during the week. On the weekend workouts be sure to complete the times while working on nutrition and hydration. Use the weekday workouts to focus on form. Add interval training to the runs and bike sessions and continue to use the various drills in the pool. Its time to consider some offshore training. Before we get started with next weeks Ironman training plan, its probably time for a motivational video: Stay focused ! Tuesday: 1:00 swim: focus here is on form. The weekend time commitment is starting to pile up but remember its very important to get these long workouts in. This plan is tailored to someone working Mon-Fri. The swim, warm up some easy form drilling and add some interval training. Time to get some straight swims in and an open water swim.Long bike should have challenging hills. Focus on hydration and calorie intake.As the runs get longer stash hydration somewhere along the route or use a fuel belt to maintain fluid intake. By now you should be comfortable in the water and really finding your swimming zone. Keep up the yardage around 3500-4000 per session and focus and relaxed breathing, both sides! Keep up with the drills and interval training in the pool and get in open water if possible. The weekday bike and run sessions are short but intense with some hill repeats and interval training. The long weekend sessions should focus on form, time and Nutrition. You should be done experimenting and have a good idea what you are going to be using nutrition wise on race day. Even the best athletes can fall short on their nutrition needs are race day if they are not prepared. See video below. Resistance training twice this week, working all muscle groups one to momentary muscle failure. Notes: This is a the last light week. Prior week was heavy and following week will also be heavy. Focus on form in all 3 disciplines. I will focus on swimming drills to perfect relaxed form. Bike training is short but will be intense with some tough hill intervals. Focus on good nutrition and proper rest. Resistance training 2 times minimal this week and continue stretching and flexibility training. Make your workouts quality workouts. For Bike and Run: always warm up with 5 min@ T1, and cool down with 5 min active T1 and minutes of static stretching. Friday: **OFF** Big day tomorrow think about fueling tomorrows workout. This is a heavy weekend. Getting the allotted time in is critical in preparing for the race. Pacing, Hydration and Nutrition will the key focus this weekend. Form and interval training should be the focus during the week. Open water swimming is recommended now for the longer swims. Long weekend, nutrition should be fine tuned and be sure to get ample rest before the weekend. Saturdays brick should include training in T3 the last 20 minutes on the bike followed by a run in zones T1 and T2 and ending the last 15 minutes hard in the T3 zone.One more week until Ironman!Practice your transition routine. Expect the unexpected. Sunday: Race Day ! Have fun! Resist the temptation to load up on extra training the last week. Focus on have a fun smooth race. Remember the goal from the beginning was to finish not to win. Stay focused on nutrition and keep a positive attitude. 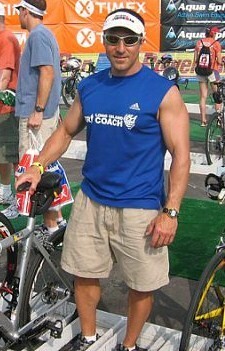 July 25th 12:31:45 Ironman Finish.I will give credit to the faster time due to experience. But the training times and intensity where not modified at all, proving that with some focus, dedication and family support, even with a family and very busy schedule, a healthy person can finish an Ironman event. As with any new workout, please consult with your physician before beginning this or any other workout plan. To return from the Ironman training plan to the Home Page click HERE.